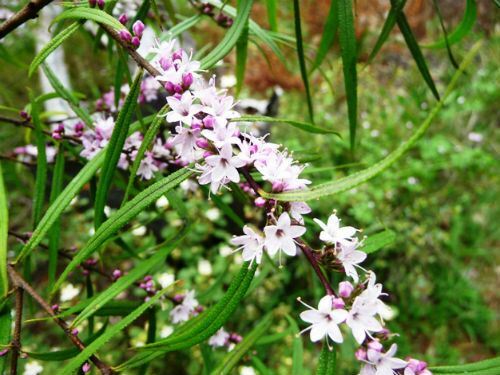 Myoporum bateae is an open shrub that reaches a height of three metres in our cold climate garden. Leaves are long, narrow, linear, sticky, dotted with glands and up to 15 centimetres long. We have observed honey bees visiting the leaves. Possibly the glands exude a honey-attracting secretion. Flowers may be white or pale purplish pink. From 4 to 10 flowers are carried in the axils of the leaves. The main flowering period is spring and summer with sporadic flowering at other times. Growth habit, foliage and flowers are all attractive features. Regular tip pruning will prevent plants becoming straggly. Myoporum bateae is considered rare. The species occurs in small populations some of which are protected in reserves. The species is found in the Central and South Coast areas as well as the Southern Tablelands of NSW. At one time Myoporum bateae was considered to be a sub species of M. floribundum (see article) but M. bateae does not have the narrow, pendant leaves of the former species. As with all Myoporums, this species propagates readily and rapidly from cuttings. Myoporum betcheanum (see article) is a similar species. M. betcheanum flowers just after M. bateae and both Boobiallas could be could be cultivated together as a long-flowering screen or hedge.